The Large Hadron Collider (LHC), the world’s largest and highest-energy particle accelerator that straddles the border of France and Switzerland, is quite busy lately playing with the most basic ingredients of the universe. Much of humanity is completely oblivious to what is taking place there, even though the elemental forces of creation are being manipulated as never before. Perhaps it’s time to take a closer look at some of the more profound questions surrounding this type of scientific research. For the uninitiated, a more thorough description of the LHC with many informative links has been provided below. “The LHC lies in a tunnel 27 kilometres (17 mi) in circumference, as much as 175 metres (574 ft) beneath the Franco-Swiss border near Geneva, Switzerland. This synchrotron is designed to collide opposing particle beams of either protons at an energy of 7 teraelectronvolts (1.12 microjoules) per particle, of lead nuclei at an energy of 574 TeV (92.0 µJ) per nucleus. The term hadron refers to particles composed of quarks. 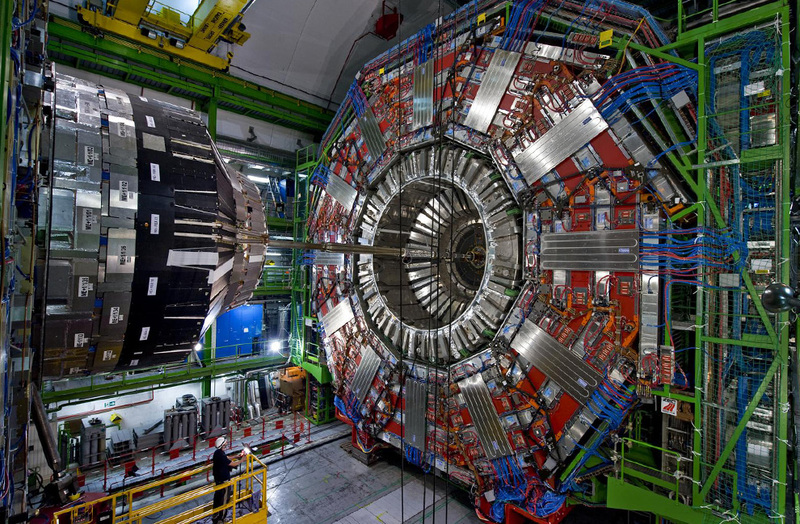 The Large Hadron Collider was built by the European Organization for Nuclear Research (CERN) with the intention of testing various predictions of high-energy physics, including the existence of the hypothesized Higgs boson and of the large family of new particles predicted by supersymmetry. It is funded by and built in collaboration with over 10,000 scientists and engineers from over 100 countries as well as hundreds of universities and laboratories. *Don’t forget to locate the worker at the bottom-center to gain perspective. Click on photo enlarge. Should CERN (European Organization for Nuclear Research) be conducting research, which purportedly can produce black holes and other “serious” phenomena, that can have awesome, unintended consequences for the entire planet? We’re talking unforeseen, far-reaching ramifications that cannot even be conjectured … for the whole of civilization, mind you. In the wake of the BP Gulf Oil Spill, many of us now know things that we were not aware of before the 20th of April. Especially that the applied science and state of the art technology associated with petroleum engineering do not always keep up with the practical necessities and technical demands of the realities in the sea or on the ground. Nor do they always pass the necessary tests during the ‘experiments’ that the scientists subject them to, particularly given the extraordinary scrutiny and rigorous criteria in their laboratories. In the case of the Macondo Prospect in the Gulf of Mexico, of course, the best expertise and equipment that money can buy, as well as cutting-edge technology and methodology, fell far short of capping an out-of-control oil well or safely containing and disposing of the spilt oil. Does the vast majority of residents on planet Earth really want to allow a rich and powerful few to indulge themselves at the risk of unknown planetary consequences? Should we be concerned about such license being arrogated unto itself by CERN in the name of scientific inquiry? Do these scientists really understand the unknown potential for inconceivable collateral damage, should these experiments go awry? Can there be unseen and unfelt toxic side effects produced in this type of particle physics research laboratory that can escape from the immediate environment and affect the surrounding French and Swiss villages and countryside? Do they really understand the implications of their unprecedented actions, should something occur in addition to the appearance of a strangelet(s)? 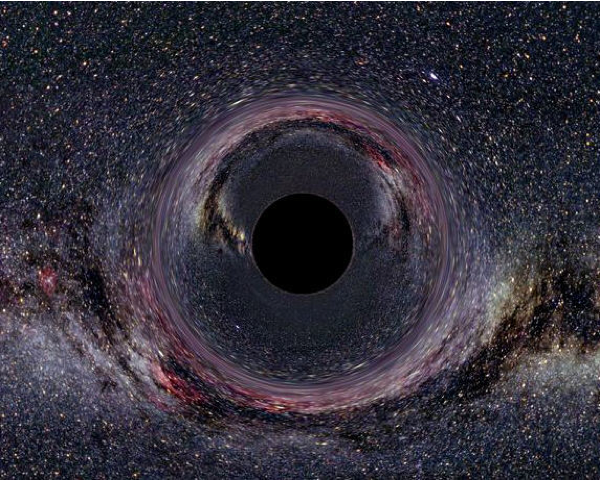 Or a black hole?! Or the most elusive and sublime God particle? We ask these questions because very few seem to be curious about any potential repercussions. Of course, the more serious question is what will be CERN’s response if unexpected contingencies arise that cannot be addressed appropriately in real time. Just as the equipment, technology and engineering of the Oil & Gas Industry had not been proportionately upgraded to respond to the challenges of the BP Gulf Oil Spill, the particle physics and nuclear research industry may find itself in a similar predicament, only with far greater consequences for humankind? Hasn’t the world already seen what can go wrong — VERY WRONG — at Fukushima, particularly in the realm of nuclear energy?! I. Their first goal is to play God. And to “play” with everything in God’s Creation. II. Their second goal is to be God. And, especially to attain divine immortality. #2 All living creatures and organisms will likewise undergo their own unique life cycle, which will always end in the death of the physical organism. Furthermore, he declares that the objective of attaining earthly immortality is complete and utter folly, especially given the way these scientists are going about it. Immortality, he says, can only be attained by those who (i) follow a true path all the way back to the Godhead, and (ii) are lead by one who has already arrived there. Then, immortality is theirs “forever”. So are a lot of other things, but it doesn’t really matter anymore as the yearnings of an unenlightened human being completely dissolve and give way to a new state of supra-consciousness. Perhaps it’s time to take back our power, and our planet. In light of this understanding it is clear that those who pursue these very mundane technological goals are either besides themselves with fright about the prospect of one day having to meet their Maker. Or, drunk with the delusion that they can somehow outplay, and live as long as, their Maker. The truth be told, immortality can be attained, if only they would take a different tack and more rational approach. The aforementioned blueprint for Self-realization has been handed down through the ages by the enlightened masters, and would be a good place for them to start. These souls have pursued the same impossible goals for millennia (with different means and method, of course) which have been defined by their ability, as well as the capacity of their crude technologies, to control and manipulate the forces of the universe, even though much of God’s creation is essentially uncontrollable. Due to fear, they have moved to a place of extreme polarity at the level of spirit, and have now backed themselves into the proverbial corner. They are well aware of the 2012 effect, as conclusively demonstrated by Mayan calendrics and cosmogony, so they know their time is very short. Perhaps Mother Nature will, once again, “gum up the works” as she did in November of 2009 when the LHC attempted a restart of its testing program after being under major repair for more than a year because of a serious electrical failure in September 2008. Their (read: The Powers That Be) long-held posture towards Mother Earth has become known as the patriarchal control matrix which seeks to dominate and control all of nature. It has been enjoined by many souls throughout this era and given rise to the current mad rush toward perfecting the power of technology. More specifically, technology which appears on the surface to confer the powers of creation, destruction, and the fountain of youth upon its owners. One need only look as far as the red planet to see what happened the last time these Men from Mars caused a planetary meltdown. We also have the legendary fate of Atlantis in our own back yard (now a big pond called the Atlantic Ocean) to consider. Now, we in no way mean to indict with these statements the many good and curious scientists who have climbed on board this bandwagon. Probably none of them truly know who or what they’re really working for. They’re just being scientists who are trained and encouraged to do exactly what they’re doing. However, it is these technicians who also ought to evaluate exactly what they are playing with. When you are in pursuit of the most fundamental particles, and substance, of Creation, there does come a time when you start to push the edge of the envelope; except that, in this case, one may fall over the event horizon* if one pushes too fast, too far, or in ways that ought not to be pushed at all. The 27 kilometer long Large Hadron Collider complex on the Swiss/French border. By the way, have the good folks who live in the immediate area of the LHC ever been consulted about the nature of these experiments? That it consumes nearly 10% of the total energy of the Canton of Geneva ought to be of concern to every Swiss citizen. Have they been apprised of the risks associated with the operation of a particle accelerator in their literal back yard which, according to theoretical physicist Stephen Hawking, can produce black holes? What really could happen every time they flip the switch on a proton collider that moves proton beams at virtually the speed of light? 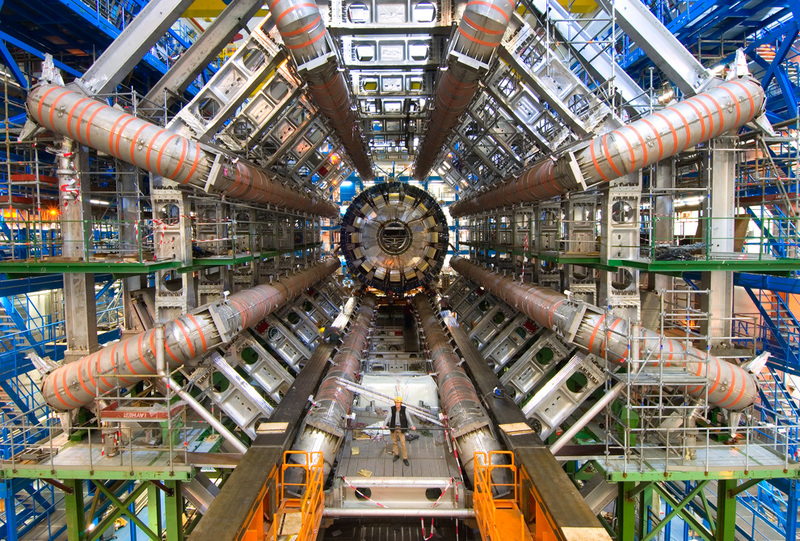 November 11th of this year is set to become a defining moment in the life of the LHC. Some have referred to it as the tipping point of sorts, depending on the outcomes, most of which cannot be known because such a device can generate new fields of energy, cause a warping of the space-time continuum, and trigger a transmutation of matter. Additionally, for those working in close proximity to such an accelerator, there is always a very high probability that the human organism will be affected in quite profound ways (e.g. alteration of the morphogenetic field), many of which cannot be detected in the present moment and may not manifest for days, weeks, or years to come. Some of these time-delayed outcomes can even cross over into parallel universes and jump into time streams outside of the 3rd density of Planet Earth. Whether this particular event on the 11th comes and goes uneventfully, or with great scientific “success”, we will never know for sure how the earth has been changed because a few souls wanted to play God when they were woefully ill-equipped to do so. We pray that the inhabitants of the Earth will be protected from such dangerous scientific experiments and schemes which only ever benefit a very few — a self-tormented few who desire to ascertain that which can only be known and properly understood through meditation on the primordial force of existence which is the real God particle. God particle – Forever the Holy Grail of particle physics and nuclear research, the God Particle is regarded as one of the fundamental forces (most theoretical physicists agree that it is much more force than particle) of the cosmos. Many religious philosophers believe it constitutes the very ground of being, while others assert that it is the fabric of creation upon which the tapestry of the universe is woven. There are some who refer to the God particle as the clay of existence. 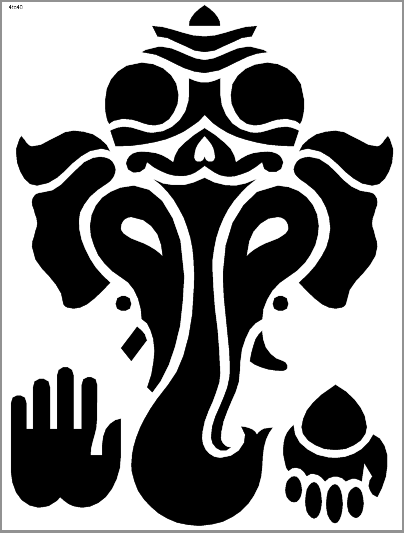 The Shaivites of India know it as Brahman and regard it quite reverently as Supreme Consciousness, the sacred substratum of all Creation. 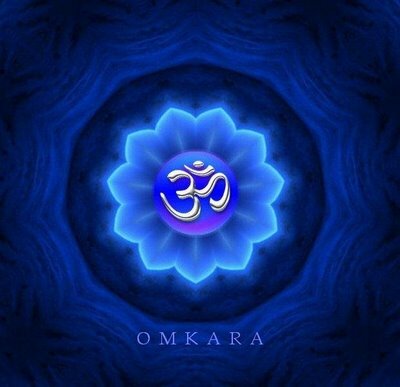 The great rishis of ancient times tell us that before the manifestation of physical reality there was sound, and that the primordial sound of Creation is OM. Therefore, the original sound-stuff of the material universe is OM itself, which would makes it the ultimate source, or perhaps the immediate precursor, of the God particle. Maybe it even is the God particle!